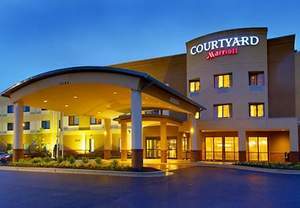 WALDORF, MD--(Marketwire - January 25, 2011) - Escape the doldrums of everyday life and create a romantic interlude with that special someone while enjoying warm accommodations at one of the most service oriented hotels near Andrews AFB, the Courtyard Waldorf. Just in time for Valentine's Day, the Courtyard Waldorf hotel is offering a romance package perfect for some well-deserved time celebrating each other. Enjoy champagne, sweets and each other with the special "Romance Package" at the Waldorf Courtyard, a stylish choice among hotels near Bolling Air Force Base, where well-appointed accommodations and plentiful amenities provide a relaxing backdrop for a fun weekend getaway. Guests who take advantage of the Courtyard's "Romance Package" will receive deluxe hotel accommodations, champagne and chocolate covered strawberries delivered upon arrival and complimentary breakfast for two the following morning. With rates starting at just $114, this relaxing weekend break is also perfect for celebrating a special occasion or anniversary. Couples wishing to take advantage of this hotel package may book accommodations online at http://www.marriott.com/hotels/travel/waswd-courtyard-waldorf/ by using promotional code LVU or by calling 1-800-228-9290. This Indian Head, MD hotel's spacious guest rooms include plush bedding ensembles of cotton-rich linens, pillow-top mattresses and cozy comforters; in-room entertainment on a 32-inch flat-screen television with cable/satellite service, premium movie channels and pay-per-view movie options. Bath amenities, in-room coffee/tea service and a mini-refrigerator are also included. The Bistro is located on-site and provides guests with a casual American dining experience with a family atmosphere for breakfast and dinner. A Starbucks coffee house is also open daily for coffee and pastries. For additional dining options, a wide variety of fine restaurants are located nearby with menus sure to tantalize even the most discriminating of tastes. *Rates are per room per night and valid for Thursday-Sunday stays through 11/17/11 based on availability at the time of reservation. Guests must be 21 years or older to qualify for the champagne amenity. Offer does not apply to groups of 10 or more rooms and may not be combined with any other discount or promotion. Please visit hotel website for additional terms and conditions. Distinctive among Andrews Air Force Base hotels, the Courtyard Waldorf provides guests with sophisticated accommodations and a convenient location whether traveling for business or leisure. Located just 30 minutes from Washington, D.C., the hotel is also just a short drive from the area's major corporate locations. On-site, all guests have access to a well-equipped fitness center, sparkling indoor swimming pool and relaxing whirlpool. Business travelers will also find a full-service business center along with additional business services and amenities needed for productive business travel. Our beautiful entrance will delight you when you arrive to check into our hotel with our beautiful landscaping and great hotel design.